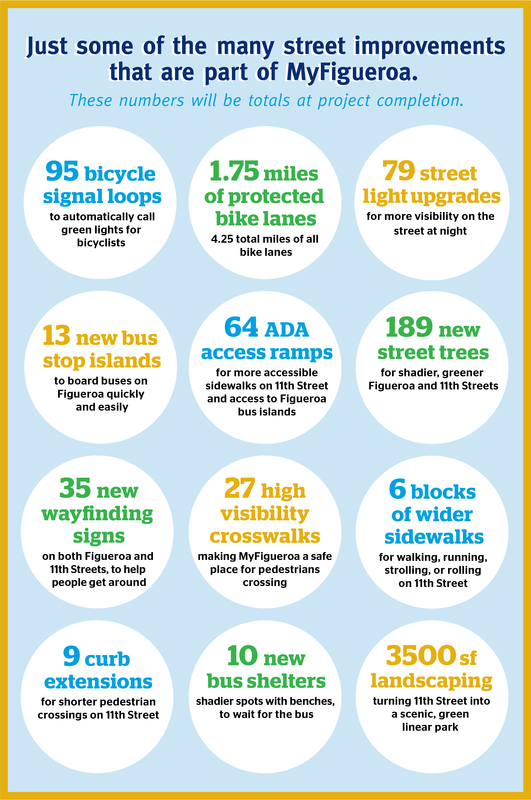 As construction on MyFigueroa is nearing its final stages, we wanted to highlight some of the numbers of improvements that MyFig has brought to the street. From bus stop shelters to new street lights, these are just some of the new elements you'll see. If you've been on Figueroa recently, you may have noticed that the bike lane striping is now complete, and the new traffic signals are now functioning between Exposition Blvd and 8th St. Here's a useful diagram showing how to use the reconfigured street. Please help spread the word to keep people from idling or parking vehicles in the new bike lane. Let's all Fig out how to use MyFigueroa together!